View live streaming of the event on Twitter and follow us on Facebook and Instagram for updates during the event. Download the Periscope app for Twitter (available for free on iOS in the App Store) to be able to post questions in real time while watching the video streaming. If you don’t have Periscope or a Twitter account, that’s okay! 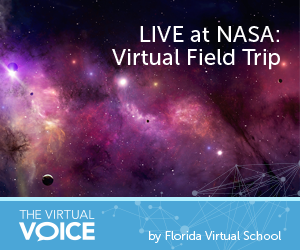 You can still tune in on your phone or computer at www.twitter.com/flvs. Please note that the schedule and launch is subject to change based on conditions for the launch. Follow FLVS on social media for more information and updates! This entry was posted in Educator Edition, Full Time Edition, Homeschool Edition and tagged Earth Space Science, Instagram, Kennedy Space Center, Live Streaming, NASA, Periscope, Science, Social Media, SpaceX, STEM, Student engagement, Twitter, Virtual Field Trip, Virtual Learning on April 10, 2015 by Marissa Draeger.